Today as I walked past the kitchen window I noticed this little guy/gal on the screen. It is called a Green Anole and is sometimes referred to as the American chameleon due to its color-changing abilities from green to brown; however, it is not a true chameleon. It is in fact a relative to the Iguana. 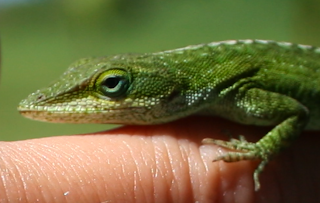 Of course I had to do my research on my new friend and found that, the typical coloration for a green anole ranges from the richest and brightest of greens to the darkest of browns, with little variation in between. There are a few exceptions, however, which are caused when a lack in one of the pigment genes occurs. There are 3 layers of pigment that make up the green anole color spectrum: the Xanthophores, responsible for the yellow pigmentation; Cyanophores, responsible for the blue pigmentation, and Melanophores, responsible for the brown and black pigmentation. 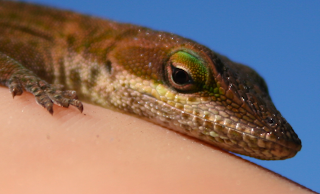 The combination of the Xanthophores and Cyanophores are what make up the different arrays of green seen in the green anole, whereas the Melanophores are responsible for its change to brown when the anole is cold, stressed, or just needs to warm up for the day. When there is a lack of one of these pigments, color mutations, or also called "phases," can occur. 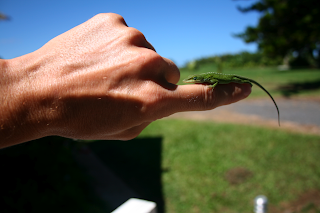 In particular, this can lead to the incidence of the rare and beautiful blue-phased green anole, which lacks Xanthophores, or the yellow pigment that makes up the green hues of the green anole's color spectrum. What results is a blue, often baby or pastel blue, anole. 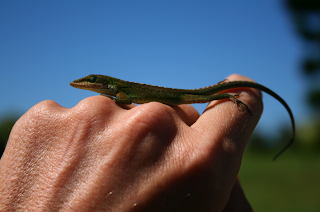 Colonies of these rare color-phased anoles have been reported, but anoles with these color mutations rarely live for long, since the green anole relies on its green and brown camouflage to hunt down prey as well as hide from predators. I have been wanting to try and catch one for some time and finally went for it. It was very timid and I took my time so as not to scare it to death. 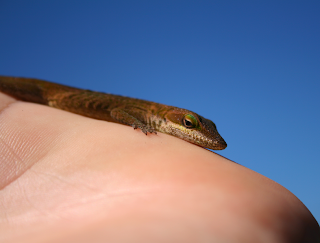 Once I coaxed it onto my finger it just chilled and was very relaxed. I was able to rub it's back and side belly which it seemed to enjoy, because when I went to put it back on the screen, it did not want to go. In fact in crawled off then turned around and came back on my hand. I hope I can get it to come back to me again soon. When I first caught this little beauty it was brown. Within a few minutes it had turned to green. I guess that means it was relaxed and warm. A little butter, a little garlic, MMMMM! Good eats!